Please Note: The new Child Care Subsidy which replaces the CCR & CCR will commence in July 2018. 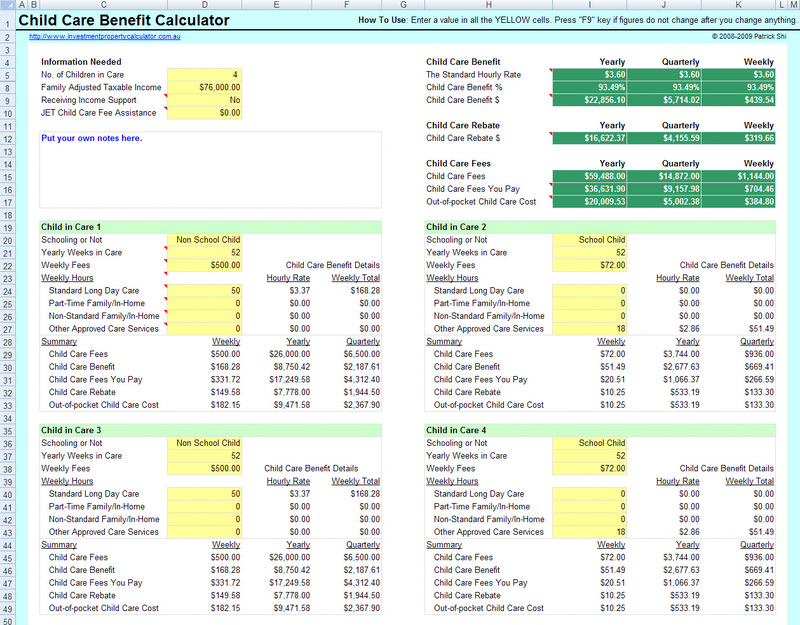 This calculator now can help you to understand if you can get more government benefits under the new Child Care Subsidy package. 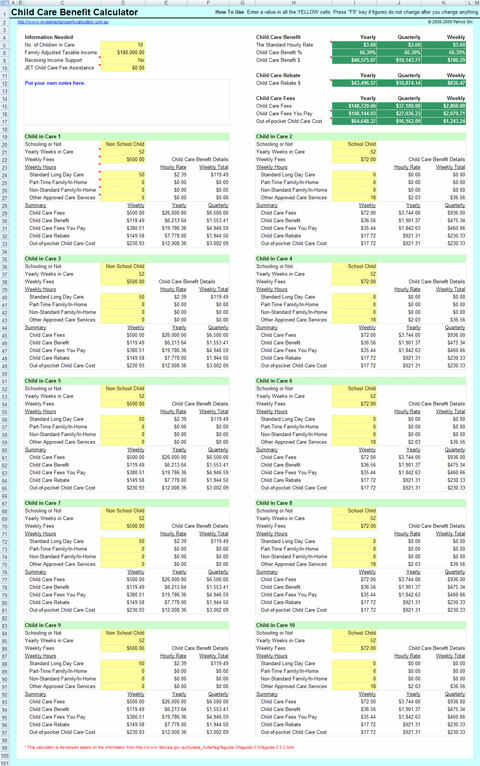 A new savings planner is added to this calculator to show how much you need to save per week in order to cover your out-of-pocket Child Care cost. The new Child Care Subsidy will commence in July 2018. It will replace the Child Care Benefit (CCB) and Child Care Rebate (CCR) with a single, means-tested subsidy which will be paid directly to service providers. Families earning $66,958^ or less will receive a subsidy of 85 per cent of the actual fee charged (up to 85 per cent of an hourly fee cap). For family incomes above $66,958^, the subsidy tapers from 85 per cent down to 20 per cent when family income reaches $341,248^. For families with incomes of $351,248^ or more, the subsidy is zero per cent. * Subsidy tapers down by 1 per cent for each $3,000 of family income. ^ Note: These amounts are correct for 2018/19 and may be subject to adjustment through indexation in subsequent years. For families earning more than $186,958 an annual subsidy cap of $10,190 per child will apply. Families will receive a fortnightly statement of child care usage from their service provider. This will make the service more accountable and provide greater transparency for families' entitlements, which includes the payment of the subsidy and out of pocket costs. Family eligibility for the Child Care Subsidy will be determined by a three-step activity test, more closely aligning the hours of subsidised care with the combined hours of work, training, study or other recognised activity undertaken, and providing for up to 100 hours of subsidy per fortnight. A broad range of activities will meet the activity test requirements, including paid work, being self-employed, doing unpaid work in a family business, looking for work, volunteering or studying. There will be exemptions to the activity test for parents who legitimately cannot meet the activity requirements. Some families who don't meet the activity test will be assisted through the new Child Care Safety Net including families on incomes of $66,958 or less a year who will be able to access 24 hours of subsidised care per fortnight without having to meet the activity test. You can find more detailed inforamtion about the new Child Care Subsidy from the Child Care Subsidy Guide published by the Department of Education and Training, Australian Government. 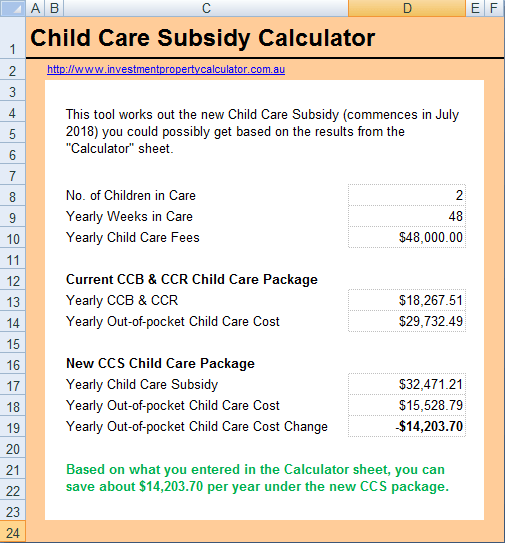 A new tool which compares the CCB & CCR to the Child Care Subsidy (CCS) has been added into the calculator. It will estimate if you can get more benefit payments from the government under the new CCS package. Please refer to the image below for more details. 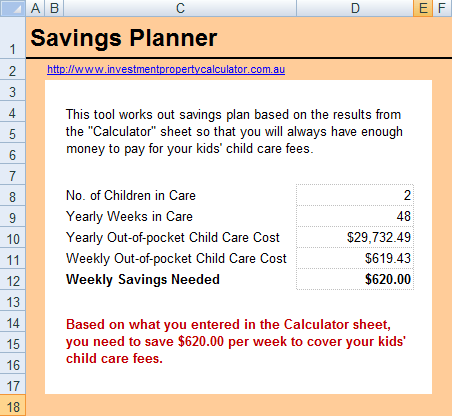 In addition, a new online Child Care Subsidy calculator has been developed which can be found on http://www.childcaresubsidycalculator.com.au. 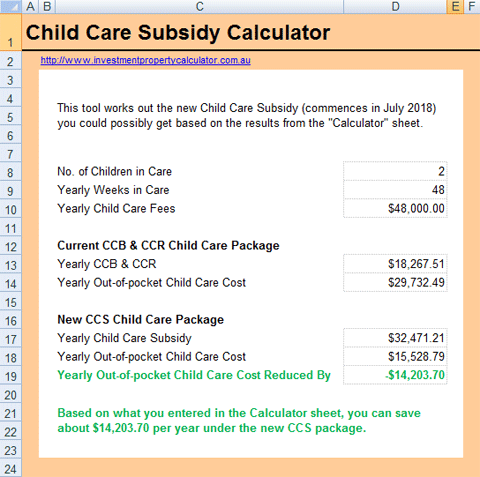 If you prefer the Excel version of the Child Care Subsidy calculator, you can download the Child Care Subsidy calculator Excel version here. Please download the Child Care Benefit Calculator or Child Care Subsidy Calculator from the links below listed. A new savings planner is added to this calculator to show based on what you entered in the Calculator sheet how much you need to save per week in order to cover your out-of-pocket Child Care cost. Sometimes the CCB & CCR ran out early March and parents had to pay the full fees for the remainder of the Financial Year. However many parents did not realise this until it is too late so they were struggling to pay the full fees. The savings planner is designed to help parents to work out a saving plan so they will be able to pay the full fees when necessary. The basic idea is that you will put the right amount aside each week to make sure you are covered for the full year. For example, your two kids are in daycare 5 days a week at $100 per child per day and you receive 50% CCR per child (up to $7,500 each per year) but no CCB. Your Family Adjusted Taxable Income is $150,000. Based on the calculator your Out-of-pocket Child Care Cost will be $30,621.41 for the whole year. 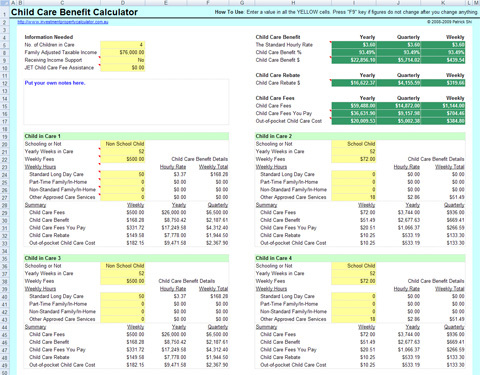 The savings planner works out that you need to save $638.00 per week to cover the Out-of-pocket Child Care Cost. If you don't save the money you might find that for the last 3 - 4 months of the year you need to use a substantial portion of your family income to pay the cost which could be a nasty surprise to you and your families.